Be illuminated by God’s Word daily as you read Daily Light, an updated version of the Daily Light on the Daily Path by Samuel Bagster, with verses from the NET and WEB Bible. Daily Light on the Daily Path contains 366 days of devotional readings for mornings and evenings. Originally printed in the 1800s, this work is timeless because each reading is a connection of Scripture verses centered around a theme. It is said to be the most popular daily devotional book of all time and has touched hundreds of thousands of Christians with the biblical message of comfort and help. Share content through Facebook, Twitter or email. 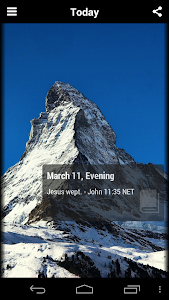 Set daily notifications to remind yourself to read your daily devotions. Bookmark and add personal notes for your favorite devotional. Track your reading progress day by day. Select and read the article for any day of the year. Customize your reading experience with different font, font size and turning on the low-light mode. Tap Tap Studio: Making Tap-worthy Apps for iOS and Android Smartphones and Tablets.